The line-up at this time was Mark Harman (vocals and guitar), Paul Harman (double bass) and Rob Tyler (drums). Both Mark and Rob also played on the Dave Phillips 'Wild Youth' album. Mark also played with The Space Cadets. The line-up changed a bit over the years, and people who have came and went were Ben Cooper, Mick Malone, Jeff Bayly and Steve Whitehouse (Sharks, Frenzy). And this should have been the end of the story, but...... as with all good things, we couldn't let them go. So they're back! The original line-up playing their early material - and with a new cd. GREAT!!!! The band were presented with a 'Bronze Disc' (sales of 25,000 units) for their first Nervous album. The presentation took place at the NEC (Birmingham) as they were in the middle of their first set at the 'press day'. Mark was totally shocked, because he had no idea that it was going to happen! In 2007, it looked like it was all over again, but Mark continued with 'Loose Noose'. However, the public were not to be denied, and due to continuing demand, Restless look like being around for a long time yet. Here is a list of some of the early CDs by this great band. It's a scam/Ice cold/ Why don't you just rock?/ High time/ Last chance baby/ Tag, man, tag/ Long black shiny car/ Face in my gin/ Yellow cab to midnight/ Morning comes slowly/ Blackat/Travellin/ High time #2/ Later/That's all right Bottle on the beach/ Here I am/Fool's gold/ Down at the swamp/ Alabama jailhouse/ Prisoner of love/Sob story/ Crack up'n'fall to pieces/ Sixteen tons/ Baby please don't go/ Here I am (dub)/Sweet surprise/Edge on you/ Slidin' on down the hill/ Why didn't I stay at home? The original ABC mixes See below for review! See below for a review of this amazing record! Recorded with no amplification, this is 'Restless Unplugged'. Juniper most expensive certification has introduced the new tracks which include JN0-100 Juniper Networks Certified Internet Associate, JN0-303 Juniper Networks Certified Internet Specialist (JNCIS-M) and JN0-331 exam numbers. 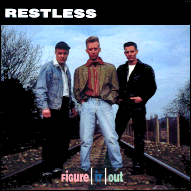 Over the years, Restless have managed to create a 'Restless' sound that is at once both identifiable as Neo-Rockabilly and Restless. Occasionally, a band manages to inject their own style into a previously existing style of music and make it their own. 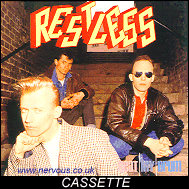 Some bands even manage to generate 'copy bands', and Restless have managed to do this, with their influence being heard on many other Neo-Rockabilly bands. The best of these is a German band called The Hot Riffs. They have a CD out called 'Job done' (one of Mark's favourite sayings! ), and if you are a fan of the Restless style, you will LOVE this CD. I promise. Meanwhile, playing games, the boys came back with a CD on Blood Sucking Records called "s'O.K., S'alright", under the guise of the "harmany bros.". There are other good 'Restless rip-off' bands around like The Red Velvet Trio and The Tin Cans. If you're a fan of the 'Restless sound', these are well worth getting. You can write your own reviews on these CDs. We'll print them on this page, which is for Restless fans. You could write a review of a good concert as well if you wish. All reviews sent to us that we print will be credited to you, and an e-mail link back to you will also be programmed in if you wish. This record was released in 1993 by Nervous. This was the last album with Steve Whitehouse on Upright bass. The whole record has a lighter feel about it than their last recordings. This record includes three cover versions, all made famous by Elvis Presley (Guitar Man, Shopping around, His latest flame). Mark Harman knows how to sing Elvis songs. Two songs are written by Shaun Kirkpatrick who played with Frenzy at this time. They are called Nowhere to go and Still Waiting. Also he plays the lead guitar on Road to Paradise and Just an Echo (A song that could storm the Charts). Mark Harman wrote 5 songs on his own. The very aggressive I Go wild, Going back, Memoir Blue (This song really makes you cry), Empty Hands (I love it) and Better than nothing (with a sixties riff : C Am F G7). Restless are changing their style from album to album. And this time they play songs for your heart and a few rocking songs.The CD also have a wonderful booklet with great photos of the band. So go to your record dealer and buy it. Finally Nervous released the first best of album from the legendary Restless. Like always on Nervous the cd includes a wonderful booklet with many photos of the band. 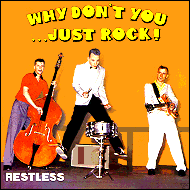 On this CD you can find all the classic hits which made Restless so popular by Psychos and Neo-Rockabillys like Bottle on the Beach, Ice Cold, Baby please don't go, Edge on You, Long Black Shiny Car. There are lot of great cover versions like New Orleans (live at the Big Rumble with a very powerful sound), Poor Mans Prison (Gene Vincent), New Girlfriend, Radar Love (Golden Earring), Old black Joe, Memphis Tenesse, Tobacco Road and Modern Romance. Other songs are Just can't take it (Beat my drum), Somebody told me, How can I find you (Kicking into Midnight), Ghost town (live, taken from the Live'n'Kicking), Dark Blue Sea (After Midnight) and the pop song Just an Echo (Figure it out). Finally it's a good choice of songs they put on this cd. Keep on rockin' and buy it at Nervous.